“We have to make some quick changes to the electoral process of this country,” said Minister Walwyn, delivering a brief address during the First Sitting of the First Session of the Third House of Assembly held at the Multipurpose Sports Complex in Road Town on June 23, 2015. 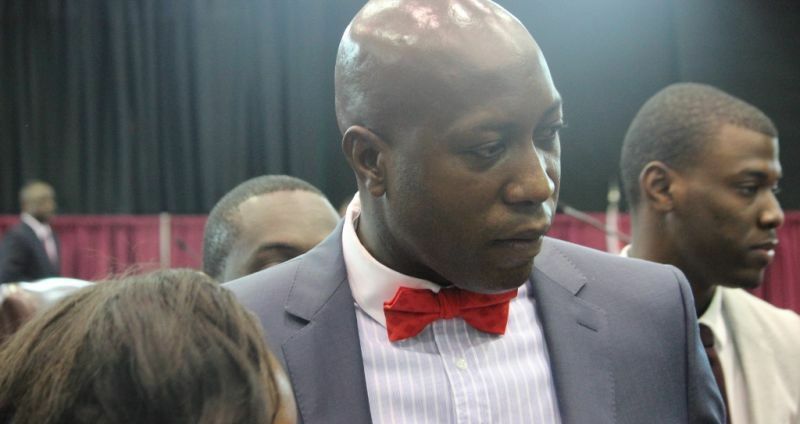 “We cannot afford at the next elections to have polling agents and the public sitting up for 24 hours to find out who win the elections,” he said. The counting of district votes began shortly after the close of polls on June 8, 2015 but it was some hours after that the territorial counting commenced. This process was not completed until sometime after lunch on June 9, 2015 following a marathon all-night counting process. “We have to get that fixed and so I want to encourage us the members of the House to get this done quickly. You can’t have polling agents working for 24 to 36 hours non-stop. 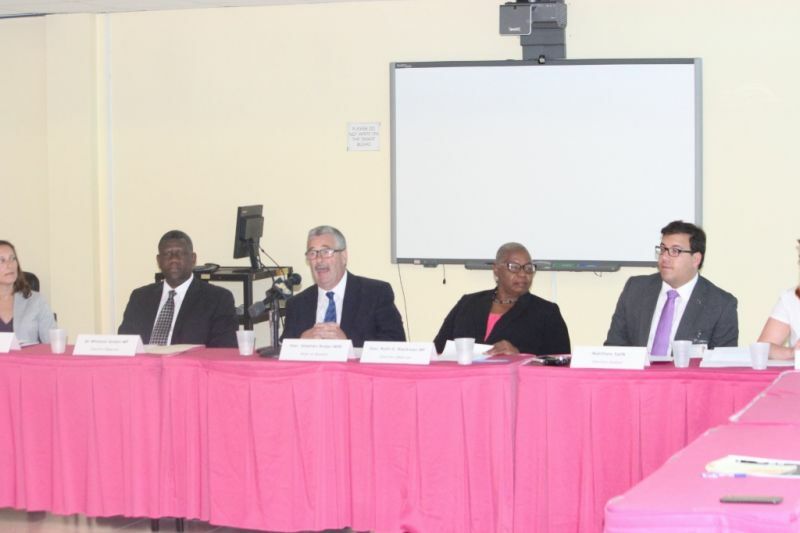 It is borders on being inhumane in many instances,” Honourable Walwyn said. 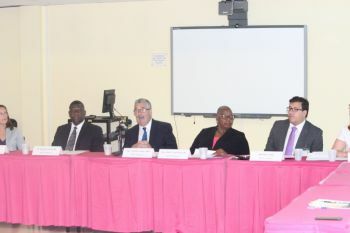 “So the things that we need to do; the recommendations that were made by the Supervisor of Elections we need to move on those things as quickly as possible,” said Honourable Walwyn. 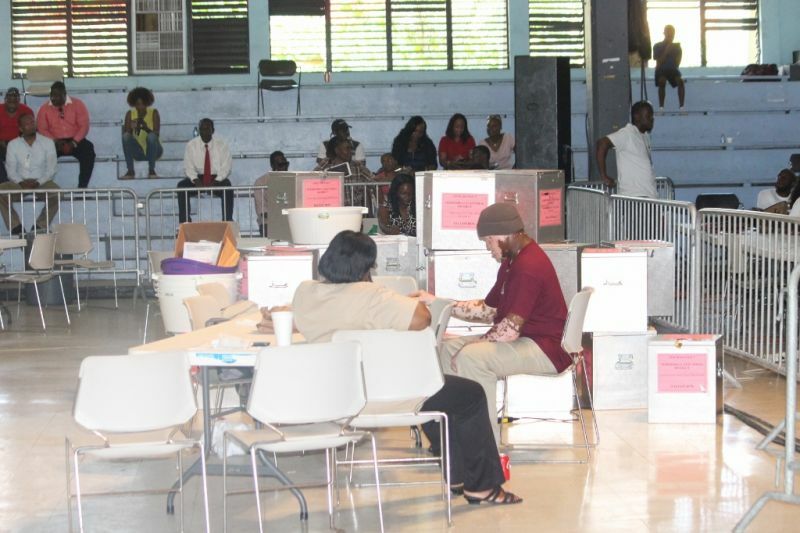 National Democratic Party supporter and prominent Virgin Islander Dr Heskith A. Vanterpool had expressed similar sentiments, saying that it is very clear the system of counting is not working for the country. 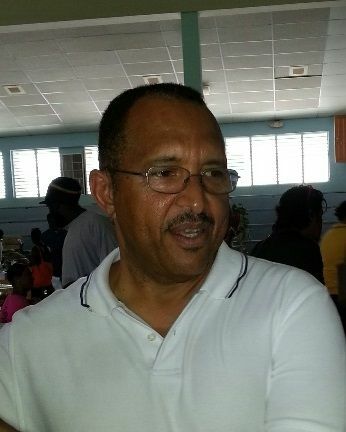 “This in my opinion is abuse of the counting officers to have them here all night and by now they are mentally exhausted, and I think that it is important that the electoral system looks to find a better way,” he had told this news site on the morning of June 9, 2015 as the counting was painstakingly underway. The Commonwealth Observer Mission that came here for the elections on June 8, 2015 with advance polling on June 5, 2015 noted its concern with the method of counting of especially the At Large ballots. In their preliminary report released on Wednesday June 10, 2015 they said that while the counting process was a transparent one, it was delayed by the fact that the elections officials had to wait for a long time for the arrival of ballot boxes from distant electoral districts. They said that both the district and territorial counts were transparent and well-administered, despite the length of procedures to read out each name and show each ballot to all present. “A positive aspect of this process is that it leaves little room for error, and in the case of a close result, precludes any reason for a recount due to the clarity and decisiveness of everyone seeing each ballot,” the mission said. The Commonwealth Observer Mission will issue its final report at the end of August 2015 with its full list of recommendations, including those relating to the media, campaign financing, ID card inconsistencies, procedural breaches among others. But this is old news the premier already said that! 1) a fixed election date so one party doesn't have the advantage of buying up advertising space before a snap election and give the other only several weeks to prepare. 2) a primary so the choices can be narrowed. 8-9 candidates means one can get elected on 20% votes. That means 80% do not want that person. Take the top three and have another run-off and see how the votes honestly shift. 3) debates where we hear candidates and their ideas, not party spin and endorsement as qualifications. 4) financial spending caps. The wealthy rule over those with good ideas but no purse. Money is dictating decisions, developments, projects, and the favoured few. Penalty for those who register in districts they do not belong to, a prison sentence for those who take people and register them in districts they do not belong to and double prison sentence for the supervisor of election, whoever it is for allowing this to happen. IT HAPPEN AGAIN!!!!! Yeah Yeah fix and fix but most importantly fix the possibility of Sea Cows Bay electing a Premier for the territory or any one district alone having that ability. Rest assured in the land of the living that they did...Cause They Did! It is said that the election was stolen and there is little doubt in people's mind that this did happen. It is a known fact that there were obeah men doing their thing brought in by ( I can't verbalize) you know who. The election results are too perfect but keep your eyes and ears to the ground All is not well. you have four years to fix election issues---we have urgent issues that is a matter of life and death that need fixing now---Agriculture, labour, health----Why are you all not listening? Why are you choosing what to fix when the people are telling you all, what need fixing...Health high fees with low patient confidence...The board period....Labour and Agriculture totally MIA--Mandatory pension plan for private workers like me, after probation, so we can get a little thing back after putting in our 30 years of sweat and strength in a company...Agriculture give the green houses to our formers with the necessary training and assistant. MV, you need to get Ronno and Picko to start doing some work on behalf of the people...Don`t be afraid of them. I know they are bullies...People gave you the most vote for a reason--Fight for the people--they need you. Has turned to bitter sand. Deception harbours corruption, and corruption leads to evil intentions. Deception are lies that cannot remain as one lie it is a cycle. I dare say that all our people here in these Virgin Islands have not taken the time to sit back to see that the corrupt undertakings through deception are killing us. With the short days in the campaign season I suppose we were clouded so from today let us all commit ourselves to making our observations and next time voting for our country. We need to start thinking on putting persons in office who we see working for the betterment of our country and not those because we like them but continue to separate and divide and bring down. That is not what we want. Unity cannot come about by liking oneself as a Giant because that in itself spoke for itself just so those in support can laugh and ridicule another. What about labelling people so that they feel like scum ALL just to win an election. Then to employ non elected representatives to work in a chosen representative district- that is the height of DISRESPECT. No No No. Gone are the days when people could have opposing political views without hatred and fear of victimization. Instead if you do not vote for me and I win I going deal with you. I HAVE HAD ENOUGH OF THIS!!!! I can sum all this up with one sentence...I am not going to deal with their evil deeds but God is more than justified to do so. If you want to call your self a fool that's up to you . The question is did this minister bribe you? Did he corrupt you? Did he take you to the poll and force you to vote for him? What are you basing your facts on? Is it hear say or do you have the facts? For you to make such statements you have to have the facts so tell me why I should not tell him to let God hold his hand. Whose hand should the minister hold on to yours? People let's move on the people have spoken can't we accept that. The final question could he bribe and corrupt all the people pick sense out nonsense. Final he that is without sin cast the first stone. If you have glass door don't throw stone. Move on? Tell the UK election observers who will be sending their report in Aug. to move on. Many in this land are so filled with greed and corrupted minds that they believe that 'God' supports their evil and will not judge all this mess that is going on in this land. "Think Again." We the good citizens of the BVI refuse to see our country turn into a third world nation filled with poverty, corruption, and crime just because democracy has become corrupted and the 'god greed' rules the minds of many in the land. The UK need to come down here and take over this government...the Governor is given the leaders enough rope to hang themselves. Let them continue to play with the election and conduct corrupt business. There will be big changes in policies and laws soon or watch UK come...this land is ruled by the UK you can't get away with the things that other places in the Caribbean and the world can here. Watch! You will see who is the true fools soon enough. And the one with the most votes will fall the hardest...UK style!